Bulk SMS text messaging provides businesses the direct-to-customer connection that can lead to a more valuable, enriching experience for everyone involved — provided it's implemented properly. Technology has made new and better communication options available to businesses, and, as a result, more and more companies are switching to an omnichannel strategy to talk to customers and partners. The one-and-done approach is dead; tech leaders are now largely responsible for driving communication on multiple platforms. By using new technology to interweave messages from a wide range of sources, businesses are able to not only draw new customers into the sales funnel, but also establish stronger relationships with their current customers or clients. And when it’s done well, these efforts pay dividends. According to research conducted by Aberdeen Group, companies implementing an omnichannel campaign retain a full 91 per cent of their customers. But there might be one essential element of a tech-enabled omnichannel approach that many executives continue to ignore, and it rests in the pockets of 2.4 billion users worldwide. Bulk SMS text messaging provides businesses the direct-to-customer connection that can lead to a more valuable, enriching experience for everyone involved — provided it's implemented properly. Even though bulk SMS seems like a marketing function on its face, CIOs and CTOs should be the ones to develop the strategies and manage the tech infrastructure needed to make it happen. And there are plenty of industries in which tech leaders are poised to break new ground in the bulk messaging world. A tech executive should be focused on putting technology in place to get customers what they want. And, as it turns out, people overwhelmingly prefer texting to calling. According to a Harris Interactive survey, 77 per cent of 18- to 34-year-old consumers who have texting capabilities feel positively about companies that allow them to communicate that way. My own company performed an independent study that found that 89 per cent of consumers are amenable to the idea of interacting with businesses over SMS messaging — that's a high level of customer engagement. For decades, the fast food industry's main differentiator from a traditional sit-down restaurant model was the ease of its service: Just walk up to the counter (or pull into the drive-thru), give a representative your order, and receive your food within minutes. But by pairing SMS capabilities with a restaurant's online ordering interface, IT teams can cut the wait time even more. By implementing SMS, quick-service food providers can give customers a way to submit their orders before they even reach the store and receive notifications when their orders are ready for pickup. Starbucks recently implemented a similar approach upon discovering that in-store patrons would often leave when faced with long, congested lines. The coffee giant's tech team had already scored a big win by developing a mobile app that now accounts for roughly 11 per cent of transactions in the U.S. Unfortunately, mobile pick-up customers began flooding stores to wait for their coffees, driving in-store customers away. In response, Starbucks tweaked the mobile ordering system to add customised bar codes to each mobile order ticket at the shop. Baristas scan the code when an order is ready, triggering an SMS alert at the phone number associated with the mobile account. Now, thanks to SMS, Starbucks can continue to scale its mobile ordering platform while making lines less congested for those who preferred to order in person. 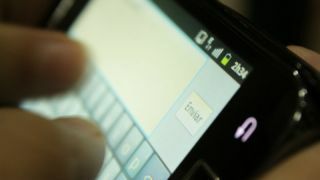 Text messages have a 99 per cent open rate, according to a report by SinglePoint, meaning that once customers are in the system, their likeliness to interact with it is similarly high. When implementing SMS, IT managers should think about where it can alleviate the most pressure from their other tech products. Starbucks, for example, is using SMS to strategically scale up its mobile app, a more marquee product for its IT team. Many of the strongest banks and credit unions have reputations for keeping customers’ funds safe. Getting information on those funds used to involve driving to a specific branch and speaking with a teller, and that was often just to learn the contents of an account. Now that the internet and mobile apps have made this process easier, SMS has the potential to be the next big breakthrough in fintech. Looking to capitalise on SMS's potential benefits, Florida-based Axiom Bank recently created its own real-time alerts system known as Notifi. Account holders who opt in to the system receive text alerts when certain events, such as a low balance or suspicious transaction, occur. This way, they can take immediate action to protect their assets. By implementing this system, the bank's IT team was able to prevent overdrafts and potential identity theft, things that a bank representative might have missed. Although SMS alerts are growing in popularity across the finance industry, CTOs looking to implement them must be exceedingly careful when it comes to privacy and permissions — people are especially likely to be protective of their personal financial data. Add pop-up prompts to your website or mobile banking app explicitly asking users whether they'd like to opt in to text communications; don't assume they all want to be texted just because they provided a phone number when they created an account with your bank or credit union. As technology moves more quickly into the hands of the consumer, compliance with privacy legislation such as the EU's General Data Protection Regulation will become more important for IT teams to be aware of. E-commerce and SMS are a perfect match, with text-based interactions serving as the primary replacement for the face-to-face conversations of a brick-and-mortar store representative. With such a service, e-commerce businesses can send buyers alerts in real time, informing them of the exact location and expected delivery date of their shipments. The artisan instrument store Bohemian Guitars began with a crowdfunding effort to get the necessary capital for its first production round, but SMS interactions have fueled its continued growth. The company simply added a widget to its website, giving users the option to send a text directly to a Bohemian representative. This opened the door to customer engagement in which staff could help patrons decide on a product and answer questions in real time. Bohemian should be a shining example to small companies leaning on their tech teams to quickly scale. The company credits this initiative as the driving force behind its nearly 98 per cent growth in sales in just five months. Of course, for this growth to happen, IT managers need to make their SMS integration as sales-minded as possible. By pairing an SMS function with data like order histories, a business could generate text alerts to special offers on products customers are more likely to buy. And the more someone buys, the more data the IT team will have to refine its SMS strategy. With the right strategy and the right tools, SMS can improve an IT team's troubleshooting, ordering, service, and conflict resolution processes. By opening up the communication lines via text, the rest of a business's tech infrastructure becomes more flexible and more efficient.